Moving to Montpellier: A French prepaid SIM card to save big on your calls! A French prepaid SIM card to save big on your calls! 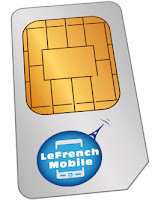 A French prepaid SIM card to save big time on your calls! Buying a French prepaid SIM card with which you do not understand anything because it is all in French and the calls are still expensive. Choose either a SIM only, a mobile pack or a 3G dongle (low data rates) to stay connected while in France! Moving-to-Montpellier readers get a €5 voucher by using this code: MONT11. Buy your LeFrenchMobile SIM card now at LeFrenchMobile. Guess what? LeFrenchMobile went Europe! Now it's the same rate to make national calls, international calls to many countries, roaming calls within the European Union!